It was the first day of summer vacation, and Mrs. McClosky’s three boys, Martin, Michael, and Max, were so happy that they leapt, and climbed, and jumped for joy! The only one who was not happy was Mrs. McClosky. “Oh, these boys!” she wailed. “No, they aren’t boys, they’re monkeys!” And one night while the McClosky boys slept, they began growing ears, tails, and fur. Soon after that, when the boys caused a stir at the zoo, the zookeeper invited them to stay – in the monkey house! Now it’s only a matter of time before the three McClosky boys discover that being a monkey in the zoo isn’t nearly as satisfying as being a little boy at home. 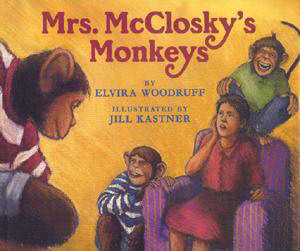 Elvira Woodruff’s humorous, whimsical tale and Jill Kastner’s bright, energetic illustrations are sure to strike a chord with every little monkey.